Todays crew and passenger list included Julia and myself. Earlier in the day, I suggested we go fishing. She gladly obliged. First, we needed bait. We turned west out the marina, then north up Folly Creek a little ways to a mud bank. Casting at this spot usually yielded finger mullet and shrimp. Today we came up empty. Must be the cold, I think. Julia motored us down further north to the twin mouths of two adjacent feeder creeks. Three casts gave nothing. The wind pushed us against the bank and made casting difficult. I stepped off the bow onto an oyster dam at the mouth of the smaller creek. I cast over telltale swirls into the pool just beyond the oysters. -three mullet- one large and two medium. We have bait. The second cast caught several finger mullet. I scooped a 5-gallon bucket full of creek water and put the battery-powered aerator to work. The fish swam and jumped, then settled down for the ride. A cold northwesterly breeze chased us down the Folly River, then into Cole Creek. I rounded the creek bend and found our fishing spot un-occupied. Cole Creek represents one of hundreds of tidal conduits meandering through pluff mud banks, lined with oysters and spartina. Like most smaller branch creeks, Cole is approximately 300 ft wide, narrowing and splitting into even smaller creeks two miles up at its distal ends. Gauging the wind and current, I threw the anchor overboard and set it, leaving the boat floating in good position for casting. Dead low tide revealed a cut bank littered with old tree stumps and spent oyster shells. I stuck the circle hook through one of the finger mullets upper lip. Casting parallel to the bank with a 2-ounce pyramid sinker attached to a fish finder rig, the mullet sank to the bottom. With barely time to reel up my slack line, I set the hook on our first fish. A short fight and a couple of runs later, I handed the rod to Julia and dipped the large redfish up in an undersized net. Too big to keep perplexes many. Red drum must fall within 17 and 24 inches to keep. The fish measured 29 ½ inches from head to tail. Hook removed and trophy photos taken, cradled in my hands, I lowered the fish back over the side. As water entered the big reds gills, it became alert, as if snapping out of hypnosis, and swam out of sight down into the depths of the creek. We hooked up with two other large fish, but a broken line and a broken fishhook hastened their escape. Between the action, Cole Creek kept us entertained. Small pods of dolphin swam up and down the creek against the opposite bank, making wakes as they swam through the shallow water of the point bar. Sporadically, we heard splashing nearby as the pods trapped mullet against the bank. A great blue heron symbiotically followed the dolphin down the creek, hoping for a free fish. A large flock of cormorants came floating, diving, and flying in wavelike fashion up the creek toward us, launching from behind and landing in front. Pelicans and laughing gulls accompanied the flock, forming a tri-species agglomeration. As the tide rose, our thoughts turned to oysters. With one 16 inch trout and a large mullet coming home for dinner, we pulled the anchor and headed further up Cole creek to collect the rest of our meal. Our favorite little oyster creek was yet uncovered by the rising tide. I stepped off the bow onto the oysters and started collecting, thinking to myself how unusually easy Im accomplishing the gathering. Collecting oysters usually means mucking through knee-deep mud and creek water, lugging a bucket. With a couple of dozen oysters in hand, we headed home. Captain Anton Dumars is a coastal geologist and ecologist, bringing Folly and the waters around it to life for both visitors and locals. 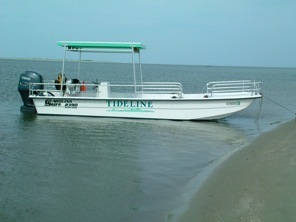 As a FollyBeach.com approved provider, Tideline Tours is sure to offer a safe and enjoyable experience. With a number of affordable packages available, call Capt. Dumars at 843-813-2497, visit his website at www.tidelinetours.com or email him at anton@tidelineconsultingllc.com to find the perfect adventure for you.